ALL AIR COOLED VW'S WELCOME TO ATTEND. SATURDAY, JUNE 2nd, 2012 STARTS AT 12:00PM. 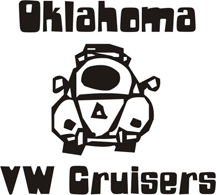 CRUISE FOR FREE or $5.00 PER PERSON FOR THE POKER RUN. Hold crap is that Richard back on the website ! Yep got the Ghia back on the road and ready to cruise..... It's been over a year since its been on the road so it's been that long since I've been on the web site. Shoot, I thought that that new wife of yours had cut off your left VW. At least you got your correct vw still !!!! haha welcome back richard. And i think the Vokaro will make an appearance as i am off that day ! Can i catch a ride on the poker run part with someone if i cant get the kit car in time ??? Yeah come on out. There always an extra seat some where. If my wife dont go I will have an extra seat as well. How long do you think the route will be? vdubjim wrote: How long do you think the route will be? The cruise will be 50 miles in length. I exspect it will take around 3 hours to complete. Start at Larry's vw service. Harrah sonic will be first stop, Meeker conoco second stop, Chandler park third stop, Warrick seaba motorcycle museam 4th stop, and Arcadia pops 5th stop. Sounds fun. I was hoping to make it but I got some family stuff to do down in TX now. And i ended up working. BUT i am off for yukon fo sure !